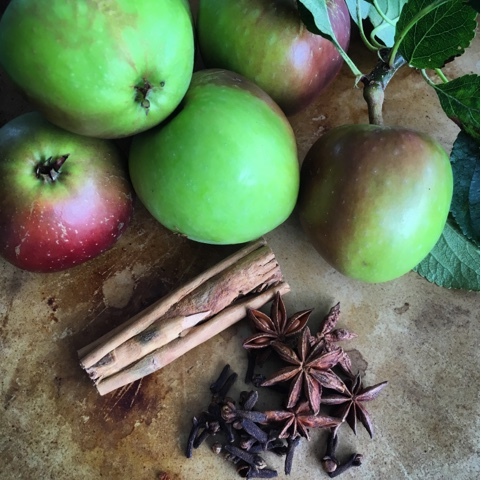 As we head towards September it's the season of mists and mellow fruitfulness. The leaves are turning, the nights are drawing in and the hedgerows are laden with berries. I absolutely adore Autumn fruits and I'm always excited to see the apples ripening on my miniature tree in the garden. I'm afraid I've no idea what variety they are but they are eaters rather than cookers and taste just great! Home grown produce always tastes better. 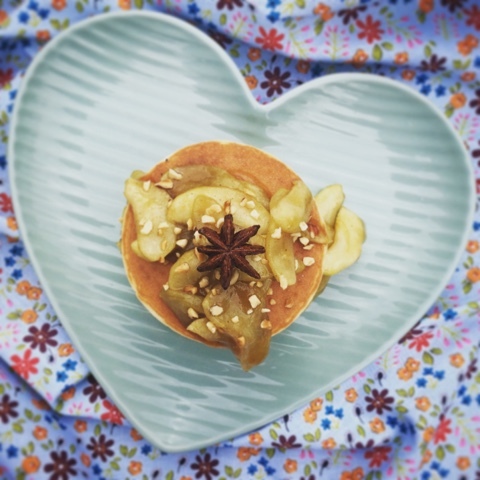 I've used the first of my pickings to create a fantastic Maple Spiced Apple Compote which is the perfect topper for a the selection of breakfast bakery goods sent to me by Genius, one of the UK’s best-known suppliers of gluten free products. As a family we are fortunate not to have any food allergies or intolerances however I'm all too aware of the issues faced by those who have to cope with coeliac disease and how limited their choices have been in terms of bakery products. Genius was founded by professionally trained chef, Lucinda Bruce-Gardyne, who developed the range after failing to find good quality gluten-free and wheat-free bread suitable for her gluten intolerant son. 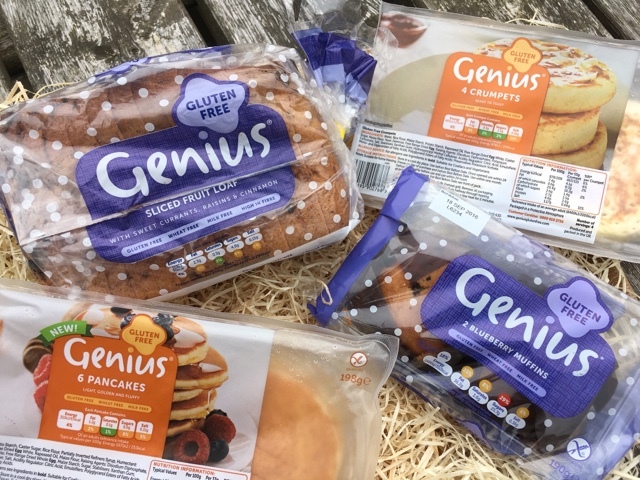 Genius Gluten Free is now the number one gluten-free bakery brand in Britain. I blind taste tested the Genius range on my family and all of the goodies were happily eaten. However they did report that the texture was a bit different to normal but not unpleasant. Warming or toasting the products definitely helped but to be honest that's probably the same with pretty much all breakfast bakes. The sliced fruit loaf had quite an open and holey texture and the further into the loaf I went the more holes there were. I found it rather dry to eat fresh but it made good toast and french bread and had a lovely flavour of combination of sultanas, currants, raisins and spices. We're really not big crumpet eaters so probably not best suited to make judgement on them however Foodie Girl is a huge pancake fan and ate two toasted with butter and jam without any complaints. The list of ingredients for the products is long as finding a way to create a gluten alternative clearly requires some complex chemistry. As someone who has no issues eating gluten that would put me off as I really had no idea what many of the unpronounceable ingredients are. However I do appreciate that for coeliacs they literally are a lifesaver. My apple compote was so good when served on top of the toasted muffins, pancakes and the fruit bread french toast. 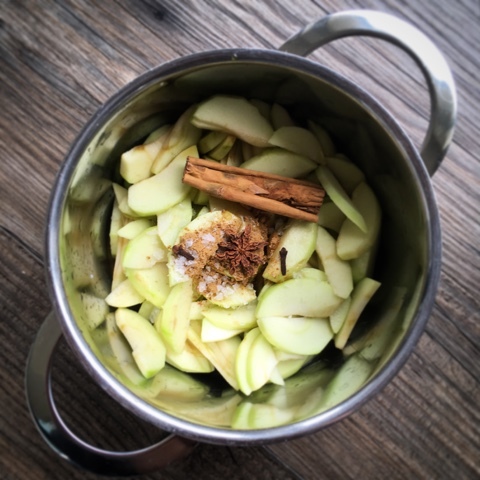 It would also work really well at breakfast time with porridge, as an apple sauce alternative with roast pork or as a desert topping on rice pudding or ice cream. Do make sure you use pure maple syrup and not maple flavoured syrup for this recipe. The difference is like night and day. We drizzled over extra maple syrup and added toasted chopped hazelnuts when it came to our gluten free pancake stack. Now that's Genius! Thinly slice the peeled and cored apples and place them in a saucepan with the maple syrup and spices. Bring to the boil then turn down to a gentle simmer and cook for 10 minutes. For the last 2 minutes of cooking time turn the heat back up to full to reduce the juices to a syrupy consistency. Can be served hot, at room temperature or cold. Disclosure : This is a commissioned post for Genius. As always, all views expressed are my own. Thank you for supporting the brands who make it possible for me to continue to share my Edible Scottish Adventures with you. I could seriously go a bowlful of this compote over some ice cream right now! I'm sitting here with a stinking cold and this would be the ultimate comfort food! The Genius range sounds really good too! There's something about stewed apples that is just SO comforting. I'm now thinking this would make a great base for an Eve's Pudding. I was impressed with how far GF baked goods have come in the last few years. I adore stewed apples! My kids ask for them all the time. Luckily our apple trees are heaving. I like the Genius products as well. My kids certainly wolfed them down! We only have one miniature apple tree so I need to choose carefully what I make with the crop. You'll have great fun with so many apples. Griddled Peaches and Honey sounds amazing!!! Shall keep my eyes peeled for the post. 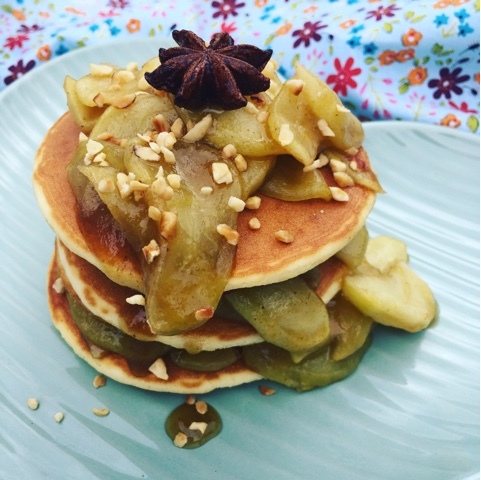 Oh my, those pancakes look amazing as does the apple compote. I love apples and hoping I get lucky with a few of my mother's again this year. I've not tried Genius as I don't have a gluten problem, but it's good to know there's something decent out there for those that do. I normally get lots of apples from my parents trees but they are cooking ones so more limited use. Hope you get lucky. There's something so special about harvesting and eating fruit that you've grown yourself. 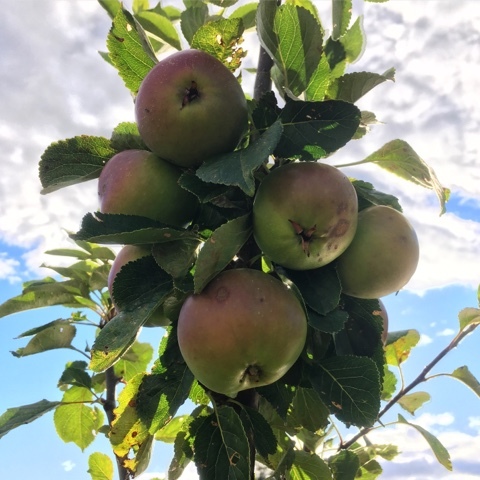 Our apple trees are ready for harvesting too, I love this time of year! I make apple compote every year but have never thought to add maple syrup, and it does sound lovely. Ive pinned your recipe to try this year, thank you. Does the Maldon salt make a difference too, I've not heard of it before? You need to check out Maldon. www.maldonsalt.co.uk It's what all the chefs use. It has a very distinctive flaky texture and taste.